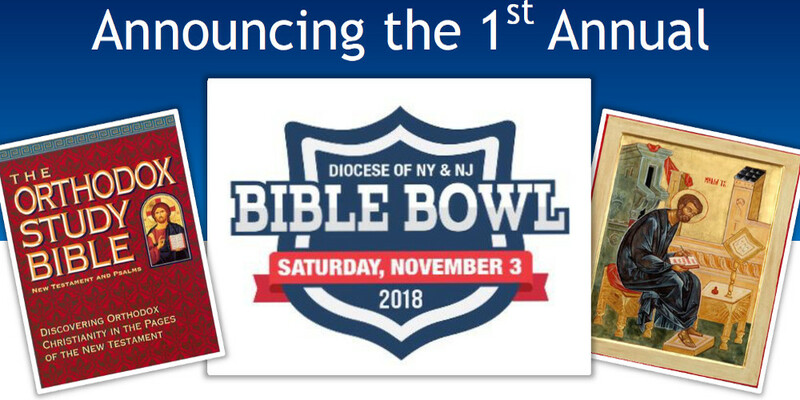 On Saturday, 3 November 2018, nearly 50 youth and adults from across the diocese gathered at Holy Trinity Church in Yonkers NY together with Archbishop Michael for the first annual Diocesan “BIBLE BOWL.” The Bible Bowl combined competition, camaraderie, and the culmination of months of diligent study of the Scriptures. 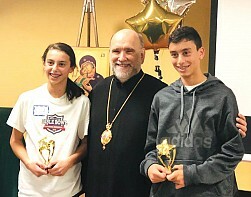 Eleven teams from six parishes competed in three divisions (Junior Youth, Senior Youth, Adult) and responded to challenging questions from the Gospel of Saint Mark. Parishes represented in the competition were: Saints Peter and Paul Church, Endicott NY; Holy Apostles Mission, Lansing NY; Holy Trinity Church, East Meadow NY; Christ the Savior Church, New York NY; Holy Trinity Church, Yonkers NY; and Mother of God Joy of All Who Sorrow Church, Princeton NJ. Numerous volunteers from Holy Trinity Church in Yonkers, as well as Assumption Church in Clifton NJ and Saints Peter and Paul Church in South River NJ, distributed custom made Bible Bowl t-shirts, prepared and served refreshments, and worked as scorekeepers for the competition. Musical entertainment was provided while the anxious contestants waited for the scores to be tallied by the Bible Bowl Band, made up of Father David Cowan (Holy Trinity Church, Yonkers NY), Gregory Fedorchak and Krista Galie (Holy Apostles Mission, Lansing NY), and Simeon Brasowski (Christ the Savior Church, Paramus NJ). Congratulations to the participants in the 2018 Bible Bowl!